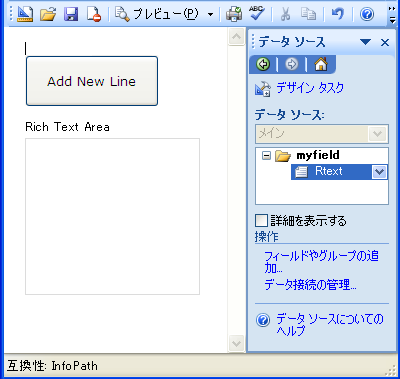 Today, I am writing this entry in English because I think it may be useful to not only Japanese, but all SharePoint users in abroad. At least I could not find a precise solution by Google (or Bing of course). It is relatively easy to add a line break programmatically in multi-line text node (refer last entry) . Though, things would be different for a rich text. The same method does not work for rich text area. So, I am going to do this by using Jscript. First, here is the sample xsn file AddNewLine.xsn. The form is quite simple. One button, one rich text node, and that is all. 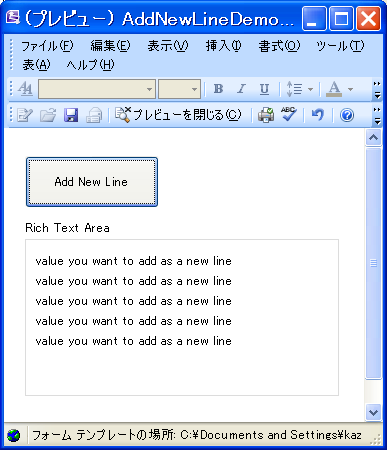 Everytime you click the “Add New Line” button, a new line is added to the rich text area. Below, I explain how to designe this form. First of all, you have to create a form with a rich text node, and a button. The name could be anything, but here I say “NewLine” for button and “Rtext” for node. Then, save this form on your local computer. Unzip the xsn file, and you should see following internal files. 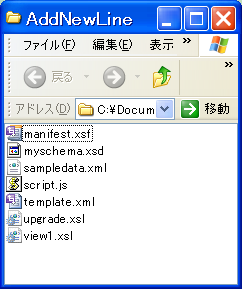 After you save the change, next open “manifest.xsf” by designe mode and then save it again. This brings you a new template(xsn) file with modified node setting. Open the new template by designe mode, and apply following script(Jscript). //otherwise copy the last node(div) and create a new node, then set value.